October is the Breast Cancer Awareness Month. 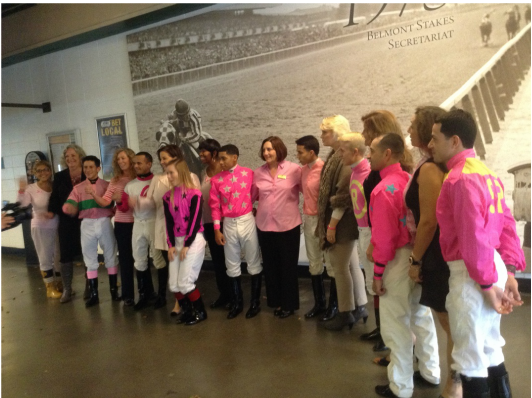 Therefore, recognizing the struggles that breast cancer patients and survivors have had to endure, the New York Racing Association first Saturday in October held a ceremony at Belmont Park in New York to honor them. Honorees included two NYRA employees, local residents and horse racing fans from across the Tri-State. Honorees and members of their families wore pink, and pink ribbons dotted Belmont Park, in addition to plaque presentation, private family launch, photo session with jockeys and a chili cook-off competition that featured Franklin Square and Elmont eateries. Lynn LaRocca, NYRA's senior experience officer, said that all at the racing association stand in awe of the survivors' courageous spirit and will to live. One of the survivors named Jodi Molion, with her daughter and husband at her side, spoke about her battle with breast cancer. "I was young when I was first diagnosed, age 34, with no family history." "I actually found the lump myself, and the doctors were actually not expecting it to be cancer. And I was cancer free for 11 years with chemo radiation. Just two years ago, in 2012, my cancer recurred, and I have been two years surviving the." Molion said said she was worried about her husband and daughter but not giving up.. "You worry, you panic, and still pull yourself together and you start fighting," she said. "You have to be yourself, experience it, and get up and start fighting through research, talking to people, networking , getting all the information. Cathy Zammatto, who has worked for NYRA for 19 years, mostly recently in sales, said she was devastated when she first learnt she had breast cancer. She said she thought she would die. "But that really is not the reality," she said. "I am doing fine and I am okay." Survivor Dina Roussel said simply,"I am well." Dee Dee's luncheonette in Flora Park won the chili cook-off. Attendees donated $10 each for the chance to choose the winner. In addition, survivors took photographs with jockey Javier Castellano, who rode Royal Posse and Miss always Ready; and Joe Bravo, who rode Perfect America. Also, Vincent Giordano of Tulip Caterers in Franklin Square donated his time.